Did you use tissue foil for this hydrangea and what is the size of paper you used to make a six staged hydrangea? One more doubt-have you tried a seven staged hydrangea? This picture shows a model folded from untreated mulberry. It was very hard to work with, and the folding is quite inaccurate. I have folded a seven staged hydrangea from a 20cm square of double tissue. 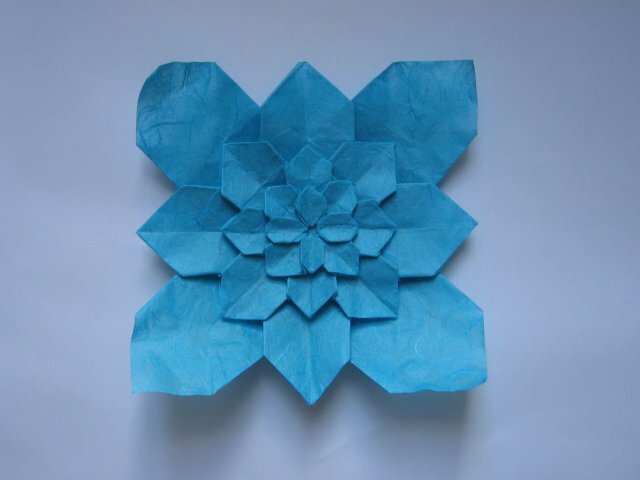 I made 7-stage hydrangea from 21cm^2 paper. It is an usual paper. But as you said it is difficult, specially to make last two steps. So I used my hair-stick to make last steps. Still it is not so neat. Here is a link to folded model along with hair-sticks. Once again thanks for your video.